Along the promenades and thoroughfares of Vieux Carré, there is a terrain pioneered by architects, ranging from colonial to contemporary, with an array of quirky cottages, shotguns, and bungalows possessing unique characteristics and rich historical value. The ridges of rooflines running parallel to the street hint towards their inner secrets of magical housings mostly hidden from public view. Yes, the streets brim with beautiful balconies and ripened exteriors of exposed brick and splintered window shutters, but behind the wrought iron gate, beyond the porte-cochère, between the twinned alleyway walls, there is a world where the courtyard becomes a backyard jungle, tucked away like a secret garden. 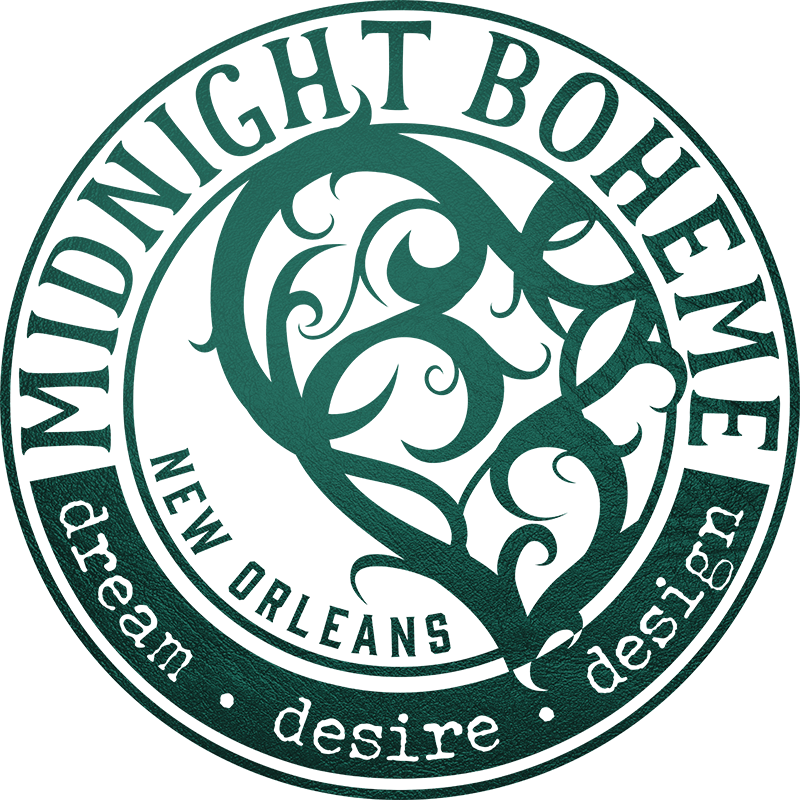 The first sensation of entering the tunneled darkness of a private carriageway in the French Quarter is a memorable experience almost indescribable, much like stepping into a dreamlike realm where imagination becomes reality. The shadowy crevice of walled brick opens unto a sun-spilled garden, revealing magnificent foliage arranged along the paving stones of a tropical courtyard. Each patio houses lovely variations of native perennials, exotic evergreens, and aromatic annuals chosen by homeowner or hired horticulturalist. Undergrowth of bottlebrush, dogwood, and white-flowering crape myrtles backdrop the ornamental fruit trees oozing with berries and nectar, citrus bulbs and kumquats, tomato-red blooms and dreamy mosaics of bloodleaf bananas. In the dappled shade of a eucalyptus tree, white and pink wildflowers bed themselves among the manicured roots of well-mulched camellias. Moreover, no courtyard is complete without a school of goldfish swimming in a plaster-over-brick basin, silver splashes of water shimmering in the sunlight. As soft winds rustle the heart-shaped leaves of Asian Elephant Ears, powerful branches of Southern magnolias feature their snowy white blossoms in spring and summer, while Savannah hollies accent their clusters of bright red berries in fall and winter. Every season highlights its flora and fauna in the French Quarter, from the heat-loving gardenias and the night-blooming jasmine to the mockingbirds feasting on edible orange fruits of pyracantha on a cold winter’s day. Rarely is there a time of lackluster in Vieux Carré. The sculptured topiary, the aromatic clusters of lantana, and the yellow blooms of ginkgo become meaningful additions to each garden like spices in a Creole kitchen. Within these bohemian-style courtyards, homeowners enjoy sipping chicory-laced coffee in the morning, entertaining friends with dinner parties of boiled crab and wine in the evening, and listening to music while reading Kate Chopin just before bedtime. Living among this southern setting is an honor and a treat, even with its drawbacks of high-maintenance and expense. Some things are worth the risk for aesthetic value, such as swirling English ivy climbing walls and trellises that may damage the stucco or grouting between brick and stone. Even the strain and tender care of maintaining a balcony garden – or “Gardens in the Sky” as dubbed in New Orleans – is a task worthy of undergoing if so desired. These Spanish iron-lace balconies extending from the galleries and townhouses overspill with exotic plants twining together, long tendrils of wispy jasmine vines cascading from terracotta pots where purple bougainvillea dangles down from hanging baskets, a gnarled forest of leaves concealing the face of buildings and windows, nearly brushing the curbstones of the street below. Between the clustering splendor of white oleander and the buxom beauty of lavender wisteria, the weeping branches of willows shelter groundcover growth where hidden gems silently sprout in season. Past the urban setting, the cosmopolitan terrain, and the general milieu of cityscape, New Orleans’ imagination continues to blossom in every nook-and-cranny from garden wall to gallery.